TORONTO’s new dedicated air-rail link will cut travel time between Pearson International Airport and downtown’s Union Station and Financial District (with two stops along the way) beginning on Saturday, June 6. Travel time between Union and Pearson will be 25 minutes, with trains arriving every 15 minutes. 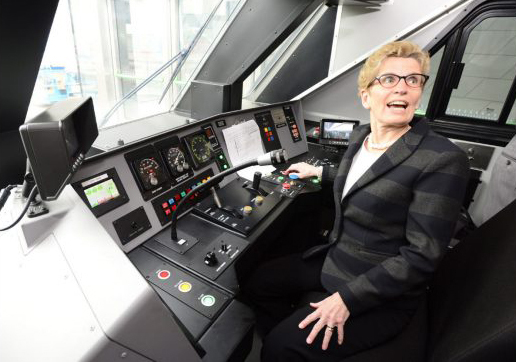 Of the top 25 financial centres in the world, TORONTO is the last to launch an air-rail link. Being Canada’s largest city and financial centre, and North America’s fourth largest city (after New York, Los Angeles and Mexico), by 2030 Pearson is expected to be the origin and destination point for almost 60-million travellers annually. The service will offer airline check-in kiosks from Union Station, free Wi-Fi, charging stations, infotainment screens and luggage racks. In its first year of operation, the new service is projected to remove 1.5-million cars from the roads. This entry was posted in Transport and tagged Canada, Ontario, Pearson-Union Express launches June 6, Toronto, UP Express Toronto. Bookmark the permalink. Decent service, but grossly overpriced.